How do you start saving for vacation when you’re living paycheck-to-paycheck? When it comes time to start saving for vacation, the sooner you begin, the better the chances of affording a trip you’ll love. There are plenty of resources to make the process easier. If you purchase a travel package through an agent, for instance, you can often put down a deposit and make monthly payments. Those kids celebrating Spring Break in the tropics? Some of them start planning a year in advance. What if you want to plan your trip yourself? You’ll need to get serious about socking money away for future travels. That starts by setting a reasonable budget. Experts say you should limit your yearly vacation budget to no more than 4 percent of your take-home pay. That’s slightly less than what you’d bring home in one paycheck if you get paid every two weeks. What if that amount won’t get you very far? Financial sticklers say you should save longer. Of course, once you establish your budget, you can also trim down the amount you need based on the type of experience you want to have. Whether you’re planning for a trip in one year or ten, there are plenty of ways to pare down what you need and still have a wonderful time. Some people travel to unwind while others want to learn more about the world. Your travel style goes a long way in helping you select a destination, lodging, activities and even the food you eat on your trip. Taking advantage of a great deal or pairing up with friends might not be the best way to save money. If you wind up in the wrong accommodations or with people who have conflicting travel styles, it could feel like a wasted investment. Have your heart set on Hawaii? Look to other, less expensive places with a similar vibe. The Riviera Nayarit region of Mexico offers similar surroundings and resorts for a fraction of the price. Want to take the kids to Disney World for Christmas? Attend one of the Christmas events in November for a big break in crowds and price. Just make sure you understand what you’re giving up for the savings. Sailing to Alaska in May provides a distinctly different experience from what you’ll see in June or September. Using a travel agent is a good way to get good prices, but they’re not miracle workers. If you’re looking at the cheapest flights and cheapest accommodations, check out online travel resources, like the travel groups at Reddit or TripAdvisor.com. Also consider destination-specific resources, like Mousesavers.com for those who are Disney-bound. Once you’ve put together a true budget to match your travel goals, you’ll be more motivated and focused on your savings goals. You’ll be able to break down how much money to put away each month and pinpoint where to find out. This is easiest when you keep tabs on your spending. Apps like Mint and Qapital make budgeting easy, but simply going over your bank statement will tell you a lot. Do you stop for coffee several times a week? How much do you spend on each trip? How often do you eat out for lunch? What subscription payments come out of your bank account each month? Are these purchases more or less important than getting away and having the experience you really want? 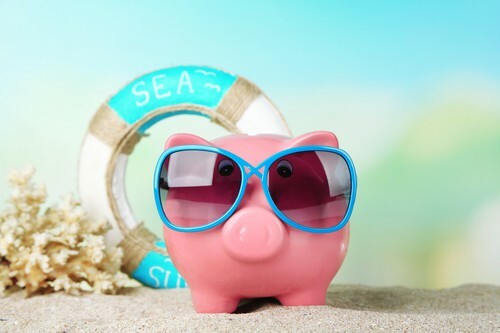 It can take time and practice to learn how to start saving for vacation. If you need a bit of wiggle room, a title pawn can help. Call or visit your nearest Title Tree store to find out whether you qualify.